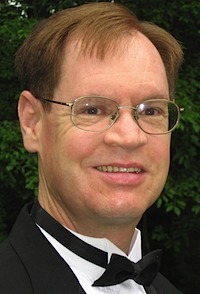 Philip Sanborn is in his thirteenth season as Music Director and Principal Conductor of the Tri-County Symphonic Band. Mr. Sanborn resides in Marion, MA with his wife Karen (baritone saxophonist in the Tri-County Symphonic Band) and is the Director of Instrumental Music at Tabor Academy where he has been teaching since 1985. He holds a bachelor of music degree from the University of Michigan, Ann Arbor where he studied with Abe Torchinsky. As a trombonist and euphonium player, Mr. Sanborn has performed with the Rhode Island Philharmonic Orchestra, Ocean State Lyric Opera Orchestra, Rhode Island Civic Chorale Orchestra, The Bass-Wingate's Band (British Brass Band), Cape Cod Symphony Orchestra, Plymouth Philharmonic Orchestra, New Bedford Symphony Orchestra, Tri-County Symphonic Band, Marion Concert Band and the American Band of Providence, R.I. As a jazz trombonist, Mr. Sanborn has performed both locally and internationally including the Montreux (Switzerland) Jazz Festival. Mr. Sanborn has appeared with Cab Calloway, Julius La Rosa, Bobby Vinson, Duke Bellaire Big Band (Bovi's, East Providence, RI), John Allmark, Tony Giorgianni's Jazz Odyssey, White Heat Swing Orchestra, Ken Hadley Big Band, SouthCoast Jazz Orchestra, the Night Life Orchestra, Mahrud and many others.